Between special releases, seasonal favorites, and pilot batches from favorite breweries, 2017 is shaping up to be a delicious year in craft brewing. 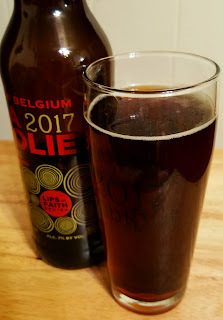 I suppose there are quite a few upcoming beers I should be excited about, but there aren't any that I anticipated as much as the 2017 release of New Belgium's La Folie. This sour brown ale was the first sour I ever tasted several years ago, and that bottle of the 2012 release mostly left me confused and at a loss. After the confluence of milder tart styles (gose and the like) acclimated my palate to sour beer, I tried La Folie again last year. I could not get over the difference between the first tasting experience and the second. The 2016 release of La Folie was one of the most complex and rewarding experiences I have had as a craft beer fan. It was a beer that entirely changed my perspective, and I've sought out new sours ever since. La Folie's 2017 release finally showed up in my area last week. It's been out for a little less than a month. Like every previous batch, the 2017 release is a blend of sours aged one to three years in wine foeders. The process of selection and blending is one of the most meticulous creative processes in craft beer. As before, the 2017 release of La Folie pours dark brown with a little foam. The aroma is strong and piercing, and is noticeable from the pour. The tart apple notes are off the charts, combining Granny Smith apples, apple cider, and vinegar all at once. The background of the aroma brings some sweet malt, caramel, brown sugar, all kinds of richness. But this time around La Folie seems particularly piercing, right from the first smell. The flavor, which left me absolutely floored with it's complexity last year, seems a little leaner this time around. I don't get as much on the front end. If I strain for it I still pick up a bit of the crackery malt and nuttiness, but the barrel character doesn't seem like a big presence this year. The finish is unapologetically sour, with cherries and citrus qualities, but I just don't get the oak and the dark bread tones I expected. This year's La Folie doesn't seem to have as much to say. It's still delicious, to be sure. It's still complex. But not quite as complex as it seemed last year. I have a second bottle of the '17 vintage, and I may age it for a while. Let it evolve a bit. They say that a sour, like a wine, is slightly different from one day to the next, and that what you get if you pour a bottle today might be substantially different from what you pick up on if you wait a day. The challenge with La Folie is making myself do the waiting. Even when it's slightly less than I expected, the experience of drinking a bottle of La Folie is still more than most beers can bring to the table.